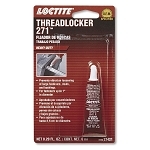 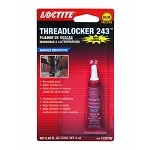 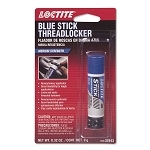 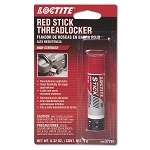 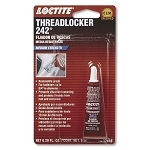 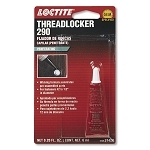 Invented by Loctite® as a revolutionary method to positively lock and seal threaded fasteners, Loctite® threadlocker adhesives are used in a wide range of applications – from delicate fuel injection components to heavy-duty transmission and engine assemblies. 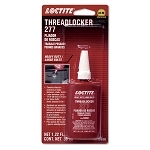 Specified by OEMs and approved for use on factory assembly lines, threadlockers work by filling the spaces between threads. 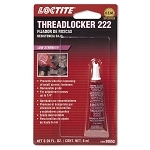 The result is a secure, one-piece assembly that will not loosen under stress. 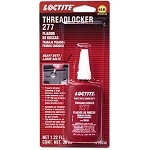 Available in varying strengths and temperatures, threadlockers perform reliably and effectively on metal fasteners of any type and size, either before or after assembly. 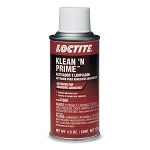 Leaks Don’t Stand a Chance! 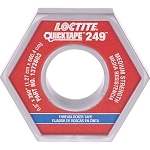 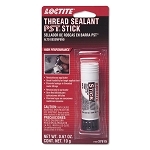 Loctite® thread sealants seal and secure metal pipes and fittings, filling the space between threaded metal parts. 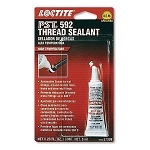 Thread sealants harden to prevent leakage caused by vibration loosening, tape shredding, solvent evaporation, damaged threads, and temperature cycling. 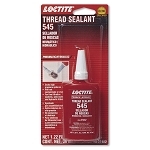 Designed for low and high pressure applications, thread sealants seal instantly for on-line low pressure testing. 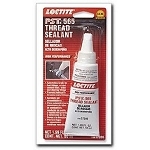 When fully cured, they seal to the burst strength of most piping systems.